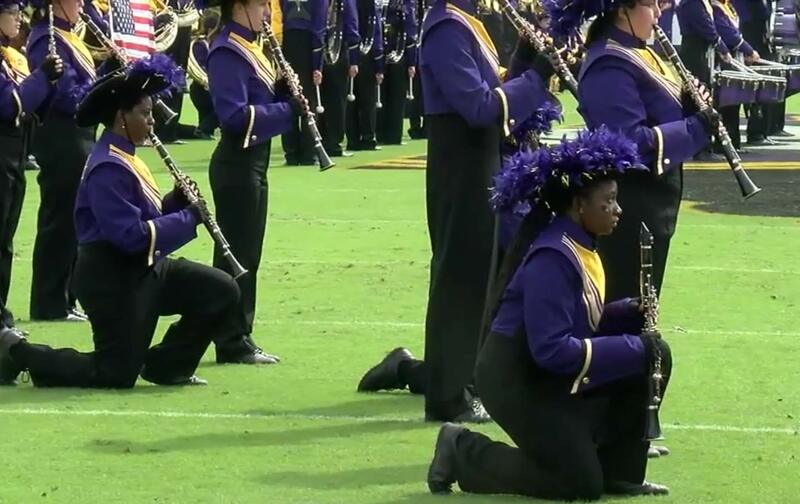 A radio station refusing to air a football game because the band members took a knee during the anthem is not “a protest of a protest.” It’s erasure. But this is not actually “a protest of the protest.” If the station organized people to protest the band, or brought them on the air to defend taking a knee, that would be a protest. This is Orwellian erasure enacted by a media conglomerate. So who does own the station? It turns out that it is an organization called—I kid thee not—Colonial Radio Group. Chairman/CEO Jeff Andrulonis said about the situation, “Difficult is the best way to describe it.” There is some money being lost here because of the non-broadcast, but Andrulonis reasoned that the station’s decision serves the FCC’s “public interest” mandate. For all the talk about college students demanding “safe spaces” from difficult discourses, it is these administrators, professors like the Pirate Dr. Tuten, and CEOs like Jeff Andrulonis howling for a safe space where they don’t have to even entertain the fact that young people at the college do not want to live in a world as unjust and racist as their parents’. Instead of engaging with or even confronting their actions, they have chosen to intimidate band members who dared protest the status quo. They have chosen to shame them. They have chosen erasure. They have chosen to validate every threat raining down on the heads of these young people. But the band members are not alone. They are a link in a chain of protests breaking out at sporting events around the country. That is a community of righteous support the forces of reaction in Greenville could never understand.